Please join us over Easter as we remember and celebrate the good news of Jesus’ death and resurrection. This entry was posted in Uncategorized on April 12, 2019 by Jon. Using archive footage that people have filmed over the years of the development of Crawley as a New Town. Produced into a film by the Independent Cinema Office. To be screened at Three Bridges Free Church (approx 50 mins followed by refreshments). Free. This entry was posted in Uncategorized on March 3, 2019 by Jon. 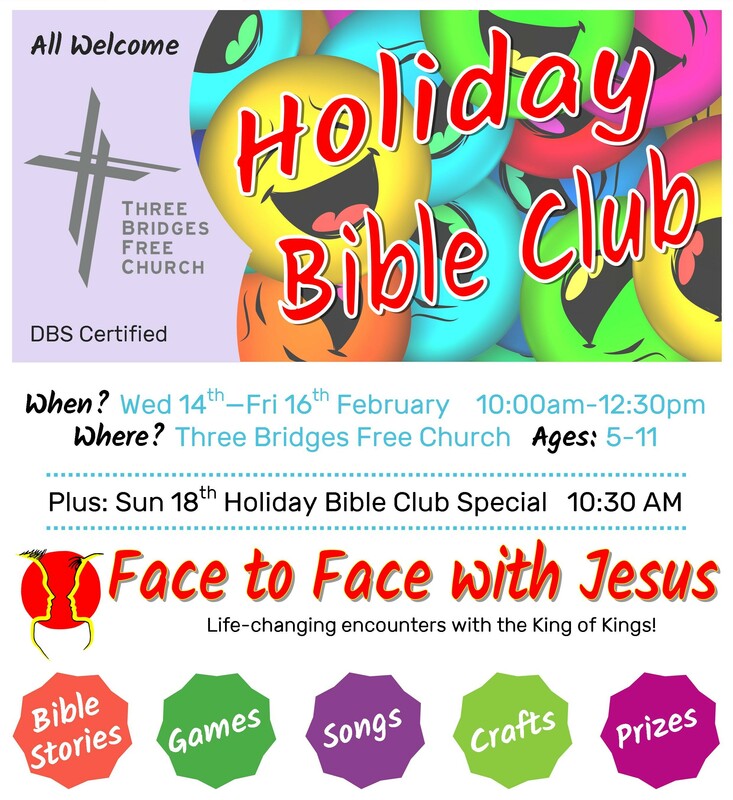 This is a club especially for children in the half term. You can leave your children for the morning and pick them up later – or there’s also a cafe running at the same time where you can enjoy a cuppa, cake and chat whilst your children have their own fun. Bible teaching, games, quizzes, songs, craft + more! It’s Free – just turn up on the day! This entry was posted in Uncategorized on January 17, 2019 by Jon. This entry was posted in Uncategorized on December 19, 2018 by Jon. Join us and enjoy international cuisine, short talk and testimony, country presentations and lots of fun! Why not come in national dress? There will be a competition! This entry was posted in Events on October 29, 2018 by Jon. 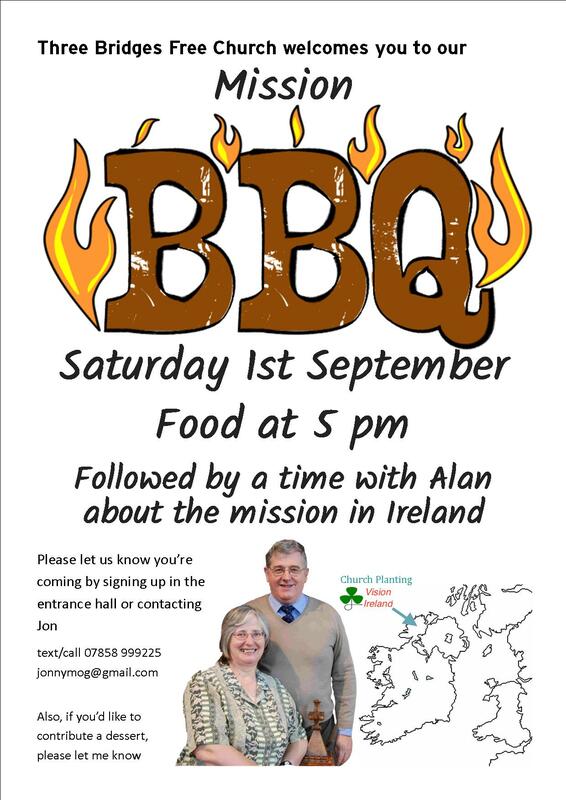 Join us for a BBQ on on Saturday 1st September with Alan and Rosemary Armstrong from Ireland who will be sharing with us about their church planting with Vision Ireland. This entry was posted in Uncategorized on August 25, 2018 by Jon. Meet Valentino our full sized Velociraptor! Youngsters can sit astride Alexis, our Allosaurus! Today, DINOSAURS are often spoken of as monsters from ’prehistory’. But the Bible doesn’t speak of long periods of time on earth before mankind, so there never was a pre-history! Even so, everyone is familiar with the idea of ‘prehistoric monsters’ roaming the earth in the so-called Jurassic and Cretaceous periods. So DINOSAURS now provide us with a wonderful opportunity to teach the true history of the world to young and old, and that’s why we call them ‘Prehistoric Preachers’! Save the date now for this fascinating and fun event. This entry was posted in Uncategorized on July 11, 2018 by Jon. This entry was posted in Uncategorized on May 14, 2018 by Jon. 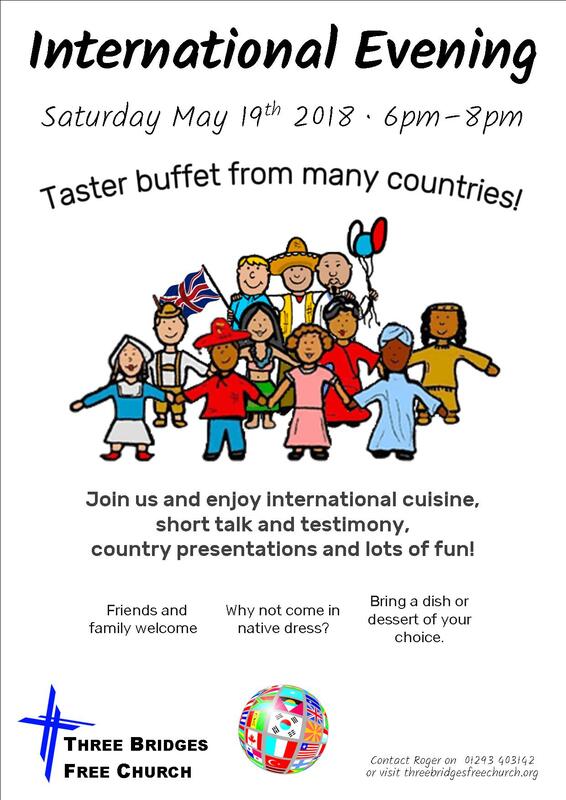 Join us for a fun evening with food and good company. Tickets must be purchased in advance. Please see Jon. This entry was posted in Uncategorized on April 13, 2018 by Jon. This entry was posted in Uncategorized on January 28, 2018 by Jon.